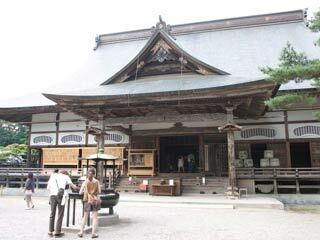 There are many historic sites in Japan. 61 of those important historic sites are registered as the National Special Historic Sites because of their value based on the science and culture. They are registered by Ministry of Education, Culture, Sports, Science and Technology and preserved the sites by the government. These registered sites are considered as the symbol of Japanese history and culture. when Fujiwara no Kiyohira settled principal images herein early 12th century. Kiyohira, the first lord of Oshu Fujiwara clan, built Chusonji for Buddhist Pure Land. Today, it is the most popular site in Hiraizumi and one of UNESCO world heritage sites. There are many beautiful temples and it has great harmony with nature. Konjikido, literary means golden temple, is the only remaining building which exists since the time of Oshu Fujiwara clan in Hiraizumi. Admission for Konjikido:　800 yen for adult. High school 500 yen. Junior high 300 yen. Elementary 200 yen. There is a group discount.